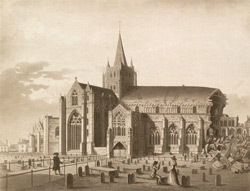 View of Hereford Cathedral by I. Wathen. The cathedral, which stands on the north bank of the River Wye was built in the 11th century under Bishop Robert de Losinga and was consecrated by Bishop Reinhelm in the 12th century. It is one of the smaller English cathedrals, its length being 342 feet on the outside and 327 feet and 5 inches on the inside. The earliest portions of the Cathedral church are the choir, transepts and choir aisles, built in 1079 by Robert De Losinga, the first Norman Bishop. The massive central tower was built 1320-40, and was at one time surmounted by a timber spire.